Did you know we offer a free online version of our software available on the web? You can easily try out the basic features right there in your browser. And that’s not all! 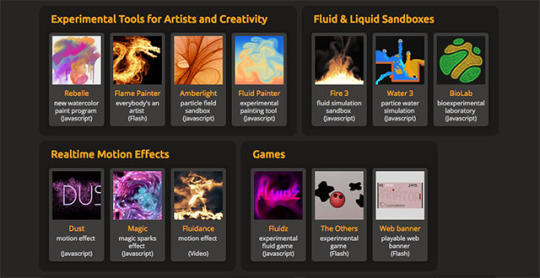 Besides free online Flame Painter, Amberlight and Rebelle there are some other exciting apps and games you can try out. The experiments are created by Peter Blaškovič, our creative guru as a part of his experimental projects and were available online from the very start of Escape Motions existence. But, you know, Java did not work in all browsers so users had many troubles running them. Caution: The experiments can cause very dangerous, long-lasting procrastination and too much fun! All experiments can be found on our Experiments page. We recommend you to run them on your desktop computers because most of them are compute-intensive.